What is the Diabetes Prevention Program (DPP)? The Diabetes Prevention Program (DPP) is a lifestyle change program that can help prevent or delay type 2 diabetes. 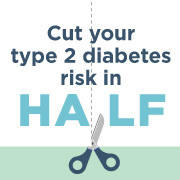 For participants who achieve modest weight loss (5-7% of body weight, about 10-14 pounds for a 200 pound person) and 150 minutes of physical activity a week, the program can help prevent or delay type 2 diabetes by 58% for people with prediabetes (71% for people over 60 years old). As part of a group, participants work with trained lifestyle coaches and other participants to learn skills to make lasting lifestyle changes. Participants learn to eat healthy, increase physical activity, manage stress, stay motivated, and solve problems that can get in the way of healthy habits. There are nearly 70 Diabetes Prevention Programs in Michigan! For the first six months, participants meet weekly for a total of 16 sessions. During the second 6 months, participants will meet monthly. Are at least 18 years old and not pregnant at the time of enrollment. Screen positive for prediabetes based on the CDC Prediabetes Screening Test (pdf). If you have questions or are unsure if you meet the eligibility requirements, contact your local DPP provider. Diabetes Prevention Programs are offered in a variety of settings, such as community organizations, hospitals, churches, YMCAs, and employers often provide classes. Visit the DPP class search page to find a DPP in your area. "Having a group of people with the same goals as me really motivated me to jump start healthy lifestyle changes." After the death of my mother and a diagnosis of prediabetes, I was motivated to make healthy changes in my life to prevent type 2 diabetes. I was overweight and had high cholesterol, high glucose levels, and poor eating habits. I joined a lifestyle change program to take control of my life. During the program, I was surprised at how happy I was making healthy changes and how much I enjoyed learning from others in the group. I am now exercising regularly and learning strategies to cope with my emotional eating habits. "It’s not about how long you live, it’s about how well you live"